Pretty simple GUI written in AutoIT for Monero. Works off the current bitmonerod.exe, simplewallet.exe and minerd.exe so you'll have to update those separately. Extract to your bitmonero folder in your Roaming profile : eg. "C:\Users\"YOUR USERNAME"\AppData\Roaming\bitmonero\"
Suggest you get the blockchain.bin file form the main threads. Source is included if anyone wants to help improve. 12.) Provide your new wallet password. This is masked out so make sure you type correctly. 2.) Extract to your bitmonero folder here: "C:\Users\"YOUR USERNAME"\AppData\Roaming\bitmonero\"
5.) Click on the Start button. 10.) Settings can be changed at any time here: "C:\Users\"YOUR USERNAME"\AppData\Roaming\bitmonero\cpuminer\minerdconf.txt"
This is long overdue but it is here at last, i will like you to write short tutorial on how to sèt up this guiminer perfectly. Binaries from unknown sources are extremely dangerous and can contain wallet-stealing malware or other forms of harmful code. Malicious binaries related to Monero have already been seen in the wild, so be careful. None of this is meant to suggest that this particular program is definitely malicious but the possibility exists. Examining the sources and rebuilding independently would be much better. I suggest that the OP upload the sources to github and post a link. Right, so anyone that want to use this, just download AutoIT and use the script in the pastebin. The monero binaries must be downloaded separately. If it's written in AutoIT, just show us the script. I haven't tried it, but based on the screenshots, it's nice work. Includes lots of stability and speed improvements. Can already created wallet.bin files be imported into this? It is a script that uses simplewallet for all the actual functions, so yes. You are on your own to figure out how to do it though. I haven't tried it. nopenopenope, this happens every time. Added support for bitmonero release v0.8.8.6. Thank you for your work, farianman. Nice, works as it's ment to. 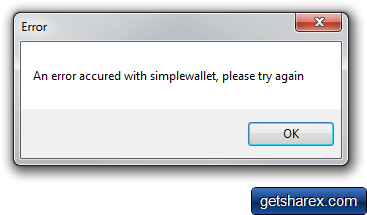 Can you work on a possibility to load an existing wallet? pretty please! Just replace the wallet.bin and wallet.key files with the ones from your existing wallet. Will work fine. Both's a good idea, then it's easier for people to find. If they miss one they will most probably spot the other. Includes importing of previous wallets. At first startup if no wallet.bin file is found it'll ask if you want to import an existing wallet, if you cancel it'll create a new wallet. If you want to import although a wallet already exists you can click file and import wallet. It'll backup and replace the current wallet.bin and wallet.bin.keys files then restart the client.